We are in the process of generating resources for functional CRISPR knock-out screening in Drosophila. We have recently developed tools which allow the expression of several gRNAs from tissue-specific RNA pol II promoters (paper). Combining tissue-specific expression of Cas9 and gRNAs markedly enhances the efficacy of conditional CRISPR mutagenesis. Expression of more than one gRNA helps to alleviate problems associated with functional in-frame mutations and gRNAs with low activity. Tissue-specific CRISPR mutagenesis. a) Combining tissue-specific Cas9 constructs with conventional ubiquitously expressed U6-gRNA transgenes often results in ectopic mutagenesis, due to leaky expression of Cas9. b) Combination of tissue-specific expression constructs for Cas9 and gRNA markedly improves the spatial control over mutagenesis. We are generating systematic libraries of gRNA pairs cloned into our UAS-t::gRNA plasmid pCFD6 (available from Addgene). Custom libraries of single gRNAs are designed with CRISPR Library Designer (CLD). gRNAs are then filtered to target protein coding exons common to most gene isoforms and appropriately spaced gRNAs are then grouped together as pairs. gRNAs are filtered and paired by Benedikt Rauscher (DKFZ, Heidelberg). Plasmids are integrated into a common landing site in the Drosophila genome using the attP/attB system. 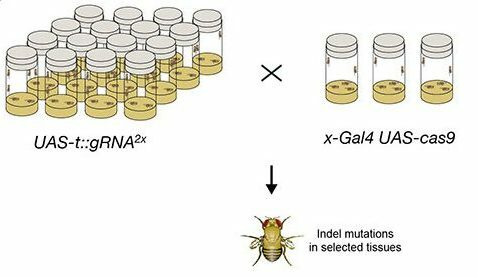 Transgenic gRNA strains can be crossed to Gal4 UAS-Cas9 fly lines to induce mutagenesis exclusively in cells expressing high levels of Gal4. Our initial characterisation of this system revealed a high degree of spatial and temporal control. Flies from our UAS-t::gRNA library can be crossed with animals expressing UAS-Cas9 and a Gal4 line of interest to give rise to animals with tissue-specific indel mutations. Using Gal4 UAS-Cas9 lines with specific expression patterns in somatic cells, one can generate in one cross flies with indel mutations in the target tissue. In combination with an germline Gal4 driver, such as nanos-Gal4, the system can also be used to create hertiable mutations with high efficiency. In a first step we aim to create a comprehensive gRNA library targeting all kinases, phosphatases and transcription factors encoded in the Drosophila genome. These tools will be made available to other labs at an early time point. To maximize the benefit to the community, we coordinate our efforts with a similar project under way at the Transgenic RNAi Project (TRIP) at Harvard Medical School.